Drain Cleaning - $59 Rooter & Plumbing Service in Phoenix, AZ provides residential plumbing and repair services. Welcome to $59 Rooter & Plumbing Service. This is an informational page concerning all things DRAIN CLEANING covering every residential drain from the kitchen, to the bath tub and everything in between. Drain rooters are one of our major specialties. Back in the early 90’s I was an apartment building maintenance worker in a number of different apartment buildings ranging in size from 16 units to 140 units. My job was to fix, clean and paint each unit when it was time to make rental ready for the next incoming resident. I had already had almost 10 years of plumbing experience in the construction industry so I was always ready to jump right in and assist with repairs any time a plumbing problem arose that needed attention or plumber repair work. I thought “if he can do it, I can too” and I have been cleaning drains on nearly a daily basis now for over 20 years. Of course I never thought my first $25 “machine” would lead me into a profession as a self employed plumber but it turned out that I loved the work and was able to build a great business. Today we have multiple top of the line Ridged drain cleaning machines and a number of different sized rooter cables to cover every situation that can arise while servicing our faithful and happy customers throughout the Valley of the Sun. And of course the most obvious of questions that I get asked on a daily basis is…. “Do you clean drains for $59?” and the answer is yes for tub drains and shower stalls. It would be impossible to do every drain for $59 and stay in business for any length of time so what we have done is commit to keeping the price at $59 for a limited number of drains such as a shower stall that we can clean with our General mini rooter. These drains include the bath tub drain, the shower stall, and we include using a toilet auger. These drains are pretty much self explanatory. 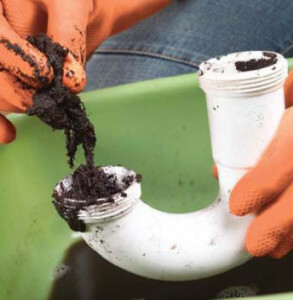 With the mini rooter and about 15 feet of drain snake we can rooter most any bath tub drain or shower stall drain quickly and usually with ease. We are happy to serve our customers in this way without making a big over exaggerated deal out of a simple drain cleaning job that only requires showing up and doing a few minutes work with the right equipment. The same goes for the toilet auger job which only takes a few minutes and is an easy job to perform. At this point I will add that anyone can rent a drain cleaning machine at Home Depot but beware, it usually come equipped with a half inch cable which is too big for a bath tub drain or shower stall drain and is too small for a sewer line. On the other hand, the toilet auger that can be purchased and is a good choice for unstopping a suborn toilet that wont unclog with a plunger. Please don’t use Drano in your lines at any time for any reason as it can cause major damage to lines. The kitchen and laundry drain is where the half inch cable can be real handy, but again beware. 50 feet of cable is often times not long enough to reach all the way through the line and clear the blockage. We use a Ridged half inch sectional cable that can be extended to as long as we need it to go to reach the blockage, and there are times in a very large house that we have needed over 100 feet to get the job done for a laundry room that is on the other side of the home from the main bathroom. The last drain to talk about is the dreaded bathroom sink drain. It always needs to be taken apart from underneath the sink, and getting things back together without leaving a leak behind that cause’s damage can be much harder than clearing the drain. In the end if you can’t get the job done yourself, call a plumber. Find a plumbing company you can trust and has the experience to get the job done right the first time. Even if it cost a little more than $59 for a bigger job, it will be worth the expense.